Low Pressure Ducting - Used for 'Commercial Aircraft' environmental systems, can be demanding in-terms of its shape and complexity. These systems are some of the last parts to be considered on an aircraft and as such have to twist and turn to avoid critical structures. The composite pre-preg materials are usually hand laid up onto plaster mandrels manufactured from room temperature wet lay-up mould tooling. The tooling is laid-up off master models CNC machined from 'Polyeurethane Tooling Board' and shuttering often made by skilled Pattern-makers who determine the split lines for de-moulding purposes. Tooling lock master model used to manufacture wet lay-up epoxy G.R.P. 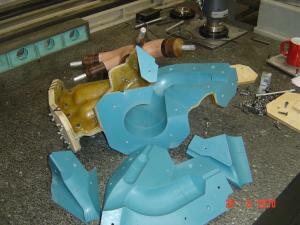 mould tooling.